On February 12th, 2017, Hanzhi Wang was invited as the special guest at Brooklyn Accordion Club, Brooklyn, New York. There was an open-mic session before Hanzhi Wang’s concert. 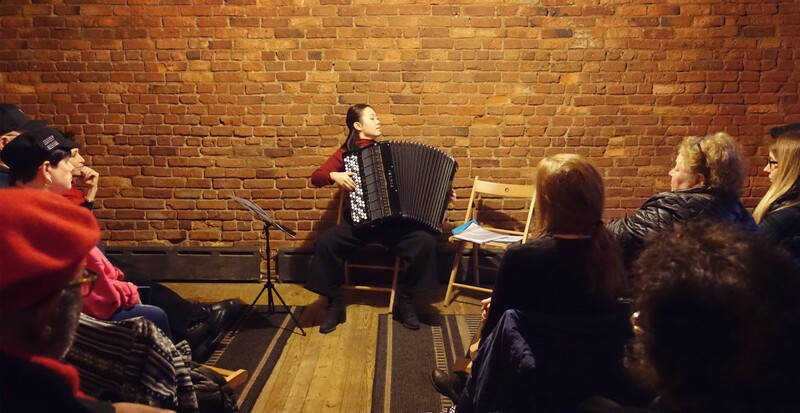 As a guest of the Brooklyn Accordion Club in New York, Mr Wang's Brooklyn 61 Local in New York presented a wonderful solo concert for New York accordion enthusiasts. The Brooklyn Accordion Club brings together accordion lovers from all walks of life in American society. When the last note of the music end, all the audience stood up for Hanzhi Wang playing long applause. In the next event, Wang Han will work with American accordionist Ivan Filipchyk to showcase more contemporary accordion music for New York accordion lovers.